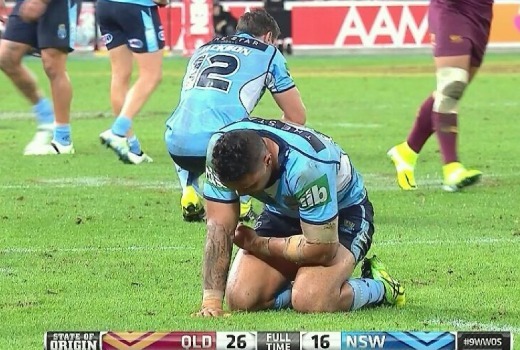 The second State of Origin match was only ever a question of how high it would go. The Blues suffered another defeat, not the perfect outcome for Nine, but the numbers were still brilliant at 2.37m (including GEM in Perth). That included 997,000 viewers in Sydney, 805,000 in Brissy and 387,000 in Melbourne. Nine advises with adjustment the figure will climb to 2.4m viewers, down slightly on 2015’s 2.52m for Game #2. With no tie-breaker to come it means Game #3 is unlikely to top Game #1 figures. As a result all other shows took a hit last night, but Masterchef still walked away with respectable numbers and the top entertainment title. Mad as Hell edged ahead of The Chaser on ABC. Nine network won with a whopping 44.5% share then Seven 20.6%, TEN 16.0%, ABC 13.5% and SBS 5.4%. Following Origin, Nine News was 1.06m / 1.06m, A Current Affair was 914,000, Hot Seat was 580,000 and The NRL Rookie was 488,000 in 3 cities. The Footy Show drew 341,000 in 3 cities. Seven News pulled 1.11m / 931,000 for Seven followed by Home and Away (789,000), The Chase (649,000 / 448,000), Highway Patrol (489,000 in 4 cities) and Criminal Minds (483,000 / 438,000). Border Security International was 284,000 in 3 cities. MasterChef Australia pulled 927,000 for TEN. The Project was 639,000 / 490,000, TEN Eyewitness News was 504,000 and Shark Tank was 483,000. Hawaii Five-0 was just 138,000. ABC News (828,000), 7:30 (561,000), Shaun Micallef’s Mad as Hell (552,000), The Chaser’s Election Desk (527,000), QI (433,000) and Antiques Roadshow (346,000) comprised ABC’s night. On SBS it was 24 Hours in Emergency (252,000), Dan Snow’s History of Railways (236,000), SBS World News (156,000) and Bosch (135,000). ABC2’s Go Jetters (287,000) topped multichannels. Glad to see I am not the only one. Mad as Hell is great, and i expected Election Desk to be just as good. But no, its been a disappointment. The whole novelty of the ‘long desk’ joke was not funny halfway through Ep 1. I just wish we could have the ‘pure’ Chaser team doing a Hamster Wheel type show. Just because The Checkout was cut short, it does not mean you need to employ everyone on Election Desk instead. Agree the focus of MaH is working in its favour. The handballing of gags at the top of Chaser is too busy and even some of the sketch storytelling is more suited to Checkout not Chaser. some people were pissed off that they cut off the coverage after the whistle. the pre show seemed to go on forever and then bang, no post game coverage. State of Origin is a very poor predictable show with the same team winning all the time, something we would not put up with on any other show. Ch9 needs to do something about it. Next year whoever wins the first game has 1 less player in the 2nd and if the maroons win despite this then they have to lose 2 players on the pitch for the whole series. This was originally meant to be a competitive tv show…….the producers, directors and writers have got a lot to answer for…..
Don’t worry Jezza, I got it. Are people starting to think everything is a reality show now? J Bar are you implying that it is not real? David, according to Ten, MasterChef won in Melbourne (7:30pm-8:30pm)? Big drop for State of Origin (2.7m was a record a few weeks ago). Nine will be a little disappointed, especially next week. But as always, the ratings were still massive for Nine. You can see city numbers under the separate Ratings post. Doubt Nine is disappointed in 2.4m. The only disappointment is it wasn’t a Blues win, to set up the third game. The Chaser are phoning it in. Atleast it seems that way after the quality of Micallef. I thought last night’s Mad As Hell was the best of the series so far. Genuinely hilarious. The show should be called The Checkout’s Election Desk. I like The Checkout when it covers consumer issues, however the Checkout crew are clueless when it comes to political satire. Last year Media Circus was flat a lot of the time when Checkout presenters were guesting. Politicians provide terrific source material but they don’t seem to be able to use it.